He wasn’t welcome in the community, either. “The police were not friendly to the black community during that era, and the black community did not welcome the police, for justifiable reasons,” Bradford says. “The black community did not want Mr. Thomas because he was the police, and the police did not want Mr. Thomas because he was black.” Things gradually improved. “The very first time he was given permission to drive a squad car,” McClelland said, “his instructions were: ‘You better make sure that you don’t wreck it, but if you do’ — and he referred to him by the N-word — ‘you better pin your badge to the seat and don’t come back.’” Thomas merely drove the car to his beat, parked it, and patrolled on foot. At least if he made an arrest, he could drive the suspect downtown: before that, he had to take the suspects in by bus. In 1976, Thomas was named Officer of the Year by Houston’s 100 Club, which helps support families of cops and firemen killed on the job. As Thomas grew older, rather than retire (“This is what I want to do,” he said), Thomas was given a desk job: guarding the employee entrance of police headquarters. But even though the restriction was lifted, he refused to eat in the police cafeteria. Thomas finally had to retire, on July 23, 2011, due to his health; he retired with the rank of senior police officer. By then, the department declared, Thomas was “the most revered and respected officer within the Houston Police Department.” And by then, Thomas was just short of 92 years old, and had put in 63 years on the job. On July 27, 2015, the Houston Police Headquarters was renamed the Edward A. Thomas Building, and Thomas, by then in a wheelchair, attended the ceremony. Two weeks later, on August 10, Officer Thomas died. He was 95. Author’s Note: Officer Thomas’s work tenure of 63 years, 6 months, and 11 days apparently beats Officer Manuel Curry of New Orleans, La. 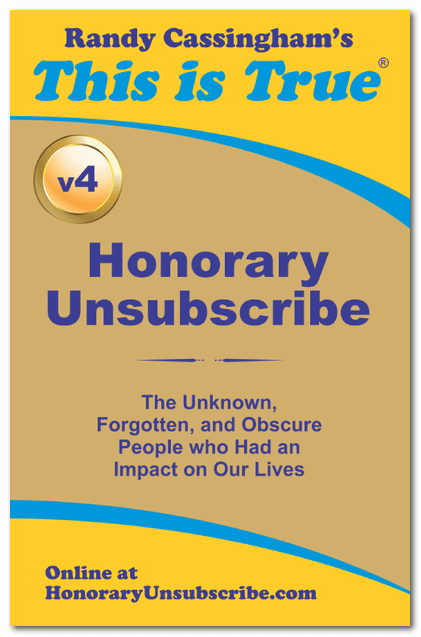 (Honorary Unsubscribe Volume 4), who was “the longest-serving police patrol officer known in the history of the United States, an active duty career of slightly more than 63 years” when he died — still on the job — in 2009 at age 84.